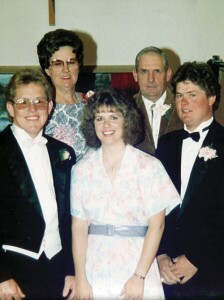 Courtesy photo Bryce Purkey, top right,, pictured with is children Jay, Cindy and John and his wife Doris, who he was married to for almost 50 before she passed. “She was the only woman I ever dated, and I was lucky to have her,” Bryce said. MEEKER I Maintaining a strong work ethic and lending a helping hand have been the most common characteristics of the people previously interviewed. Bryce Purkey certainly fits right in. Purkey has been the voice of the Rio Blanco County Fair for approximately 25 years and has volunteered for an incredible number of charity events, fundraisers, and auctions around the area. His voice is as much a part of Meeker as his involvement in the meat packing business. Things he grew up learning have become avenues for Purkey to make a living and make a difference. Purkey was born in 1932, to John Frank and Josephine May Hawkins Purkey. He was one of nine children. Growing up, he learned the trade of a butcher, which was passed down and mastered through many family generations. Both of Purkey’s grandparents were butchers, one in Illinois and one in Rifle, Colo. His father ran a packing plant and dairy until 1941, when approximately 150 hogs came down with an illness that wiped out the entire herd. The family then moved to town and began a meat processing business. The Purkey Packing Plant opened in 1944 and Purkey began cutting meat at age 14. He never missed a year until he joined the Army in 1955. In 1962, the packing plant burned down. Purkey built a new plant on the same land and operated it from 1963 to 2004. Purkey was married to Doris, his “Texas Sweetheart,” for nearly 50 years before her passing. “She was the only woman I ever dated and I was lucky to have her,” he said. 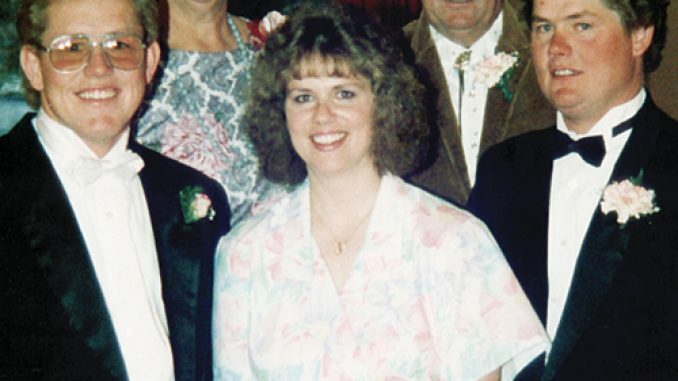 The two had three children: John, Jay, and Cindy (Gaugh). Purkey has seven grandchildren and five great-granddaughters. In the tradition of his grandfathers and father, Purkey has passed his trade on to son Jay and grandson J.P. They now operate Purkey Packing Plant, processing both fair animals and wild game. Purkey is a walking textbook on wild game numbers. He has seen elk and deer numbers change drastically. In 1992, his plant processed 1,500 deer and elk. Approximately 65 percent of those animals were deer and 35 percent were elk. In 2009, however, the plant processed only 400 animals. The ratio of deer to elk flip-flopped completely. Purkey remembers passing up four-point bucks and seeing incredible numbers of deer many hunting seasons ago. Now, the number of animals being processed at the plant reflects the overall decline of the mule deer population. Another change Purkey has witnessed through the years is the change in cattle breeds processed at the plant. The overwhelming majority of animals processed has changed from Herefords to cross-breeds. He remembers when calves used to weigh about 400 pounds. Now, most are 550 to 750 pounds and some are even larger. Purkey’s experience with fair animals makes him a great auctioneer. He taught himself how to run auctions in 1957, and has worked at the Garfield County livestock sale barn, the county fair and many other places. He is well known for his voice, and even more so for his generosity. He donates $10 to every child participating in the Rio Blanco Fair who completes a project that is not auctioned (leather projects, cake decorating, et cetera) because he believes it is important for kids to show an interest in these clubs and be rewarded for their efforts. The Lions Club and Clark’s (owned by Purkey’s granddaughter Shannon Slaugh) also donate an equal amount to show their support for the hard work that goes into all the 4-H projects. This year, 74 kids received donations. Purkey has great memories of growing up in Meeker and the friends he has made along the way. He is a dedicated family man who believes in hard work and giving back. He said, “I will get up and go to work as long as I can.” Just prior to this interview, Purkey was fixing fences and working at the packing plant. Purkey has a heart as big as his words are fast and will always be known for the voice he has used to raise money and build hope. MEEKER I Pvt. Jonathan Burnell was graduated from BCT (Basic Combat Training) in Fort Sill, Okla., and is now in Georgia attending his AIT (Advanced Individual Training) training at Fort Gordon.